My parents never bought sugar cereal. I had to go to Grandma’s house for the “good cereal”. 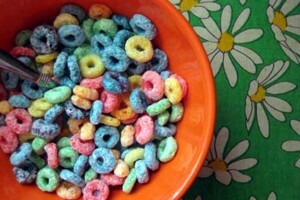 Froot Loops is a cereal Grandma would buy for me and I remember the characteristic sweet citrusy smell of this cereal. My first impression of laevo Linalool was “Froot Loops”. Other flavor chemists or perfumers might describe linalool as spicy, floral, woody, fresh and reminiscent of household cleaner. Linalool is a terpene alcohol, meaning it a component found in many plants. It can be found naturally in citrus, bergamot, coriander, cinnamon, rosewood, laurel, mint, basil, birch, berries, grape, celery, peas, potatoes, cloves, cumin, mustard., etc. Linalool is an inexpensive flavor material. It finds its way into many flavor and perfume formulas. It’s especially important for papaya flavor (it characterizes the fruit), mango, berry and citrus flavors. There is a patent on a blueberry flavor formula that consists of cis-3-hexenol and Linalool in a 1:1 ratio http://ip.com/patfam/en/24431763. Personally, I feel that Linalool adds depth and creaminess to flavor formulas. It is used in papaya flavor at high amounts because it is characterizing, but most other flavors need only a teeny bit of linalool to positively affect the final flavor. Typically, I reach for the linalool with most every flavor I create: peach, strawberry, mango, tea, herbal and orange. Linalool is a chemical that we encounter everyday, not just in the flavor lab. Is there any difference in organoleptics with the laevo enantiomer versus racemic? I suppose that l-linalool is what the natural enzyme produces versus a synthetic route? Hi JJ: I can’t remember evaluating the enantaiomer(d-Linalool) in it’s pure form. Coriander seed oil is listed in literature as being primarily d-Linalool.